Tis the season for pasta salad! And, this recipe is the perfect kick off for summer. No bland, mayo-based pasta salads allowed in my house. And, evidently no pasta salad leftovers are allowed in my house. That kind of bummed me out. Guess I’ll make more next time. 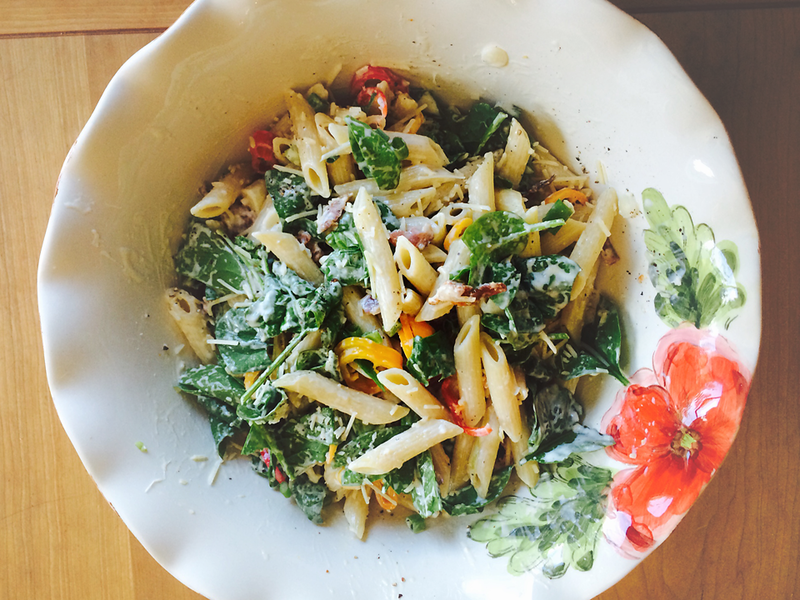 Bacon Caesar Pasta Salad was totally inspired by my love for Opa Caesar salad dressing. 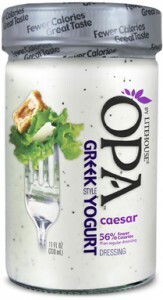 This zippy Greek yogurt-based dressing is in the refrigerated produce section. It’s fantastic. Try it. I’m serious. I bought two jars last time because I can’t stand to be without it. In a large bowl, gently toss together pasta, bacon crumbles, peppers, green onions and spinach. Pour in Caesar dressing and toss again. Add Parmesan cheese and black pepper to taste. Toss one more time and serve.